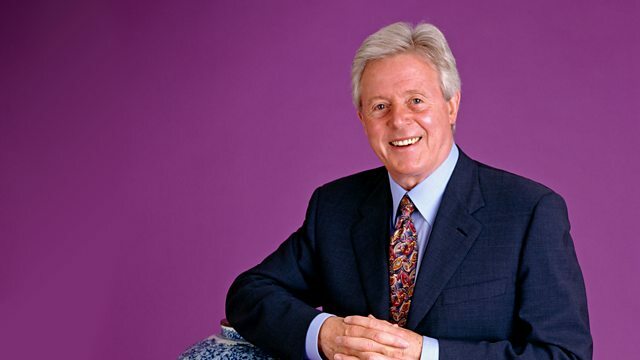 Michael Aspel presents a show from Dumfries, where antiques being evaluated include musical drinking glasses, a pianist's finger stretcher and drawings by Beatrix Potter. Browse content similar to Dumfries. Check below for episodes and series from the same categories and more! when English law decreed that you had to be 21 years old to tie the nuptial knot. and they could do worse than linger awhile among the delights of Dumfries and Galloway. Many of his songs and poems came to him while he was on horseback. and there's a heritage trail linking sites associated with him. This is where he lived and died. Here is where his bones were laid. which, 100 years later, influenced a pupil from Dumfries Academy. and he went on to write over 30 plays of his own. came while he was playing pirates with two friends in this garden overlooking the River Nith. to keep the origins of Neverland alive. Wooden swords on request. usually the setting for ice-skating and bowls championships. to anyone turning up with relics of local heroes. What a lovely dish! How long have you had it? and, um...she paid £4 10s for it. -Yes, from an antique shop. -but she only had £4 10s on her. -So £4 10s all those years ago? It's, of course, Chinese and extremely beautiful. so that's 200 and... Ooh, my maths aren't very good... 260 years old? Which is a long time to remain in this absolutely perfect condition. One hopes it's perfect. If you ring it, it should - if perfect - sound like a little bell. Lovely, isn't it? Absolutely mint. Mint as the day it was made. Beautifully decorated in the style of Imari. They are massive stones. They make an absolute punch, don't they? smoky quartz. That is transparent, this dark brown smoky quartz. in the original fitted case. I'd date this to about 1845,1850, so it's early - tip-top condition. I think if you were selling it today that's going to make something in the region of £1,000 to £1,500. This brooch doesn't look inspiring, does it? -You've got this blue stone in a surround of diamonds. -We were told it was a Burmese sapphire. whether that is true or not, we don't know - and that his wife had worked for royalty. India rather more than Burma, I would agree with that. in a diamond-star cluster frame, date it to about 1885, 1895. Um, it's actually really rather a good sapphire. It's this very collectable blue colour, a medium milky-blue colour. if you were selling it, we're looking at £2,000 to £3,000 for it. -So, although that's got the punch, that's got the value. -I think we've got the gist of it. -That was his most famous song. -And many other songs on it. Lauder Ha' was Sir Harry's last home, just outside of Strathaven. -He had several homes during his lifetime, but he retired to Strathaven with his niece Greta. when I was 6 or 7 years old, gave me an initial interest in Lauder. I see you've got a couple of photographs of the old man himself. Yes. This was at Lauder Ha'. These were items that were in Lauder Ha' and sold from his estate. -..you've got books and all sorts, but you haven't got a stick. -Ah, funny you should mention that. and I bid one more time and then I thought, "There is this bush called the Lauder bush,"
-and being a Scot I thought I would just grow one rather than buy one. -Oh, very Scottish of you! Splendid! -Well, it's a difficult thing to value. The piano itself is not a particularly valuable piano. -and it would be wonderful if you put it on display. -"To Sir Harry Lauder..." He was knighted after the war. -For his work with the war service. -and it's been a pleasure looking through it. I can see the name of the sitter - David Anderson. Who is he? He's my four times great-grandfather. -Lovely pearls, with his initials. -Don't know how they did that then. Absolutely stunning, very nice. And he looks like he was quite important. He was Warren Hastings' right-hand man in India. 1790s. Well, probably earlier because there was a portrait of him in 1797.
because this is a very beautiful miniature indeed. Really quite an important thing. -I'll take your word for it! and it says over here "Cosway". Now, is that who you think the artist is? Supposedly, yes, um... It's in the family book of pictures is that as well, and it's on the frame. Well, the thing is that it's not actually signed by Cosway. -Exactly, there's a large "E" in it. -It's a very cursive "E", slightly tilted over. And I have no doubt that it is the signature of another artist, called Englehart. but he was also very good, and he didn't really drop his standards. so that would post-date your great, great, great, grandfather's tour of duty. -It's worth about £5,000, £6,000, £7,000. And yet it's such a good one, so rich, so strong, that it could well reach five figures. -I wonder if there's a family resemblance? not one of these, I have to say - something a bit more modern. Obviously it's too old to be yours, so where did it come from? My father bought it in London in 1919.
so they bought this bike from Maude's Motor Market. -He bought the bike simply because he couldn't get home? -OK. And how much do you think he paid for it? -He paid... 100 guineas for it. -You're fiddling with a piece of paper. -This is the evidence, is it? -£105 13s 6d, with all the little bits and pieces. £105... I mean, that was a fortune. -In 1919, you could have bought a house for that amount of money. -A flat or something like that, yes. An extraordinary amount of money. -Was your dad a seasoned motorcycle rider? -No, he hadn't ridden one before. having never set foot on a bike before, and heads off to Dumfries? -How long did it take him, do you think? -He slept overnight somewhere in South Yorkshire. and made the raincoat into a tent and lay there till daybreak. -He picked up a hitchhiker on the back of the bike. And while they were going along he thought he felt the hitchhiker feeling for his wallet. -Oh, when he had his arms round him? but as soon as the guy got off, Father just drove off and left him. Well, that's an incredible story, the history of it. But then - let's have a look at the machine because the machine is no less extraordinary. and what is very special about all the Phelon and Moore bikes is this. and that's completely unique to this particular company. So because of this slope, they called it the sloper. which immediately puts a sort of collector's premium onto the bike. Is there any way that you think we could say that it was made before 1914? -'14? No. I'm in touch with the club at Cleckheaton. -from the serial numbers when the bike was made, because it wasn't new when my father bought it. -which would fit in with the family story, it would have a value of around £4,000. -so it's certainly worth continuing with your investigations. -It's been great to have it and it's brought back lots of memories for me. -Have a guess as to what it might be worth. -I have no idea. Might it go to four figures or not? I'd be terribly disappointed if it didn't. It's very, very commercial. -I think, at auction at the moment, between £1,200 and £1,500. -Bunny, what can I do for you? -I thought you'd be interested in this elephant. Underneath it's got that. but... This is broken. It's French. I wondered if you'd seen one. "Dites electronique." And then it's got various patents. I would suggest that it's the equivalent of a table bell. Yes. What fun! How would it go off? -Quimper - somewhere like that. Now, what's in this box? -Now, that's very different. Very unexpected. When I got it, it was totally black. It had either been in a fire or left in a loft for years and years. -Where did you buy it? -In Edinburgh, in auction, in 1991.
of childhood scenes with animals, in farmyards. It is delightful. Have you heard of a toy manufacturer called Bing? -..and toys in the metal area. I've never seen them making a tea set. -I would say £300, £400. -It's known as Mum's Queen Anne bureau. Well, it's actually quite correct. not much after 1710. One or two things to look at straightaway. and we're looking at something made 1710, 1715, perhaps. You've got three marks there which is where the original handles went. Hello - and the feet. -One of the feet has been a brick for some years. When you look inside, there you can see three holes. That was probably the original, and then they put something on later. -A lock has been taken out and patched there. But that's quite healthy. I don't mind that at all. Much better that than all disguised and camouflaged. rather than a flat surface. That came in and stayed in until the 1740s. Always a mark of quality. Signs of wear, where the underneath has rubbed. There you can see compatible signs of wear. We're building up a picture of authenticity. they were sold by auction. It never went up in its social surroundings. The farmer went to the lord's sale, the lord never went to a farm sale. -and two pieces of furniture. which has this wonderful cushion-moulding drawer. -Now, inside, I imagine will be... Shall I give you that key? ..a host of secret drawers. but that's typical. There were secret drawers everywhere, in a decent piece. -These come out. Little ones at the back. That slides forward. Great quality. and we can see it in its former glory. I shall come over here. Chaps, if we can prop up... Put some feet on it. And then you start to see it. These mouldings are wonderful. Applied with the grain going from top to bottom. -By the 1730s, the grain of the wood went this way. It's a lovely colour, isn't it? particularly when it's of this quality. Big mouldings... It's a person. Restoration - I would do very, very little. I've always felt guilty about not doing something to it. -It's smiling at you. It's saying, "I'm quite happy." -And, for insurance, between £25,000, £30,000. It's just on the house insurance. -I wouldn't sell it if it was worth a million. That's volume one. They were too heavy to fetch them all with me. -and when this sort of thing comes out, we all buy it. It's usually when somebody dies, out of the attic it comes. What I'm saying is there are a lot of these around. They don't fetch a great deal of money in auction. -If you had the whole set, they'd fetch about £40. -for well nigh 40 years. which is denoted by the fouled anchor sign. This mark here. And it has the maker's mark - DG for David Gray. Fairly prolific maker - mainly of flatware. This is a fish slice, with a basic decoration. -Can you remember where and when you bought that? and I believe that the vendor really didn't know of the maker's origin. -You knew what it was at that time? -I had pretty good idea. -but I think it was £28. you're looking at about £700. -That's not a bad start. -Much better than in the bank. for Mark Hinchliffe, another well-known Dumfries silversmith. you've got to think of at least £3,000, possibly more. And it's got the mark "IP", which is for Joseph Pearson. I've never seen a Dumfries wine funnel. I would confidently expect it to be worth between £4,500 to £5,000. -You get crystal bowls on stems for drinking out of. -but it's rather nice to hold. I wouldn't mind drinking a dram of whiskey out of that. but those who are sure they know, say it's to do with picture-framing. Are we right? You're wrong. You're way out. -I'm in the music business. I'm in the music business. Would this do something to the piano? N... No, not to the piano. Have a little look at it now. -There's felt down two sides. Is that significant? It stretches your fingers. It stretches the width between them. -It's an instrument of torture! -Call it what you like, but it has been put to use. -Is this for your mum or for you? -Nadia. Lovely. What do you think it is, Nadia? Is it a toy? -Putting on the window ledge. She's got it. Putting on your window ledge. This is by a potter called Sobei Kinkozan. He was the most prolific of the top three makers. and a studio making really good ones. -And this is one of the good ones. I like the shape. At first sight it's just a square, but it isn't. It's very subtle the way these shoulders lead down. In fact, these panels aren't quite flat. They curve inwards, and it gives it a really strong shape. The panels are beautifully painted. It dates from about 1885, 1895 - somewhere around there. but the majority wasn't made in Satsuma, it was made in Kyoto. That's where Kinkozan's studio was. -How did the damage happen? -They had a fire and it was damaged in it. That is amongst the worst bits of restoration I've ever seen in my life! Probably, they done it theirself. It's what I call chewing-gum repair. It could be broken down by a skilled restorer, and it should. to restore it to its previous condition. To get that restored would cost you £300, £400. -Sounds like a lot of money for a chip. But you've got a pot which at the moment is worth £2,000. -And if you spent the 300 on it, it would be worth £3,000. -So I'd recommend you did that. That bit was missing and it was completely red-rusted. -Have you done the washing in it? I don't think my wife would be very pleased with the result. was developed in the 19th century, mechanically, but done by hand. and you go up and down like that. -That then became mechanised, with a handle on the top. Electricity makes the whole thing, in a sense, modern. The first electric versions of this were made in America between 1906 and 1908. -We weren't sure of the date. of making that process mechanical was developed about 1908. So, you've got that, and then that does it in there. -which would've been by hand. -And you can either wash or wring it. -Now, this is made by Beatty's, isn't it? Here is a wonderful lady demonstrating how it works. which gives us roughly the date of the machine. We can't be more certain than that. What I like best is this lovely quotation. "Put the clothes in, touch the button, close the lid, the washer does the rest." Just like today. "You can tend to something else while it washes the clothes. "Come back in 8 or 10 minutes and every garment is snowy white." -8 or 10 minutes only. Better than a modern one. -Now it takes an hour. -and, therefore, I should think the value's £300 to £400. and it's a typical, top-of-the-range trumpeter clock. Most people would initially think, "Maybe it's a cuckoo clock." But you've probably peeked inside. I'll do the doors manually. You've got these two men who should be blowing trumpets. What happened? The trumpets were nicked, really. They were stolen in a flitting. -Yes. I don't know what happened. These nice doors, which we've got at the sides, show the movement. And a series of pipes, a fantastically large spring barrel. When did you last have this thing working at home? -I would say about 25 years ago. Yes. The bellows seem to have perished. We've got a series of horns. But you've got a full music barrel that is both pinned and bridged. You've got an enormous amount of levers here. It's a shame that it's not working. It's completely jammed up. If you haven't seen it working for years, I won't try to get it going. You've got these massive bellows here which would have driven air through all these pipes. played a marvellous tune and then popped back in again. I only took the back off for the first time yesterday. -You've never seen inside before. We've got a series of pipes. It's on a par with an organ clock. This is top of the range. I'm going to suggest a date, probably 1870s, 1880s. These novelty clocks are very commercial. that is going to be an absolute minimum of £3,500 to £4,000. So, it's going to be worth spending a bit of money having it cleaned and overhauled. -The bellows are easy to do. -It'd drive you mad when it was running! -I could stand the noise. A mouse reading a newspaper, on a stool, with its lovely tail. And I notice it's signed "HBP" - Helen Beatrix Potter. And "1890". Well, 1890 was 12 years before she wrote Peter Rabbit. But she was doing these drawings then. These are very early. Again signed. Again, really detailed. She's doing really fine brushwork. Those two are probably worth between £5,000 and £10,000 each. -They belong to my daughter-in-law's mother. The Borders are not far from the Lake District, which is how the connection is made, is it? -I think Beatrix Potter's brother farmed in the Borders. -And so this is the connection. but I don't think it's Mr Todd. This one's worth about £5,000. And then these wonderful ones of squirrels. because we have stages of this. and the date 1894 here on the side. But then we go to this, which is beautifully finished. That is stunning. Those two - £5,000, £6,000, £7,000 each. This one - we'll go to another pile here... I can hardly believe this! and two rabbits, again black and white, working. That one probably about £10,000. Another one here - I love this one, actually. "Squintena Tabby. Licensed dealer in tea." who are obviously kittens, looking through the window. -That would be worth £12,000, probably. And this one. This is fantastic. I'm sure I know this drawing. I'm sure it's from a book. possibly left by Peter Rabbit's father or Peter Rabbit himself. £15,000. Probably more for that. One with a rabbit in. It's only a little drawing, but it's superb. -I'd say £10,000. She's signed it. Then, uncharacteristic - possibly an early study for Peter Rabbit - is this one. It's very much like Durer, the Durer picture of the rabbit. It's meticulously finished. Beautifully done. I'd say £12,000 for that one. Last, but not least, are the ones you've had framed. And these are absolutely stunning. I can't remember what that comes from, but it's one of her books. This one I don't recognise at all. -It's some rabbits round a bag of buns. I would say £50,000 for those...each. You've got the best part of £250,000 worth of goods. -It's incredible. Thank you for bringing them in. -bones, spoons, tin whistles... I think that was all. In a village concert party, between the 1950s and 1970s, which raised a lot of money for charity. -So that was all there was in your lives - music, music, music? -Sheepdog trials and concerts in local halls. He's obviously sitting in front of the object here. So, I'll ask you to hang on to that whilst we open up...the coffin. -And now you tell me about this. -He called it his musical glasses. ..which for a canny Scot and farmer 30 to 35 years ago was quite a lot. I've never seen one of these. I'm absolutely fascinated to see one. or if you put water into a glass, you can change the pitch. -Is this a replacement glass? it'll reach the pitch. Even though it seems to be out of sync in terms of sizes, it will achieve that note. This lovely board tells us what the notes are. I'll take this out because it looks as if it may rub on the glasses. It almost has the look of a homemade musical glasses set, and actually that's what it is. We're not going to see another one of these for a very, very long time. this would be a must. I mean, you could also keep your drinks on those, drink OUT of it! to find an equivalent in a London shop. -The secret is not to have the glasses wet, but to have your fingers wet. Oh, they recognise it, they recognise it! I first knew her in a drawer in my mother's house, just the head and the limbs and body all in pieces. -and then we were allowed to hold her carefully sometimes. -and she used to leave her dolls by the fire, and they were wax ones and melted. -So he came back one day with this doll, apparently. -To make up for all the wax. -To make up for all the wax ones. She's probably made of bisque, which is unglazed porcelain. Her eyes are made of wonderful glass known as "paperweight eyes"
because it's the same process as making glass paperweights in Paris. Um, you say she had a new wig made for her? -The original wigs would have been made of mohair, which is from the mountain goat. so if you ever cleaned her, you should avoid the eyes. and it should have a stamp on the behind, as it does. the Jumeau factory won a gold medal for making Jumeau dolls. -compared with these rather hefty limbs. She's not an ordinary dolly face. She's known as a "Jumeau triste"
because she looks rather wan and sad. and insure her for £10,000. Bit of a worry, suddenly. Yes, it puts her in a different sort of category. We'd better give you some special wrapping to take her home. Yes, I don't know that she should go in that old bag again! Well, the show may have come to you from the Dumfries Ice Bowl but it's been as warm as toast here all day. in about 1900. Small but perfectly formed. And now it's time for us Sassenachs to head for the border, which is less than 30 miles away. So to the people of Dumfries and Galloway, thank you. And from this lovely part of the world, goodbye. A set of musical drinking glasses, a pianists finger stretcher and Harry Lauder's piano give this edition from Dumfries a musical flavour. But Michael Aspel and the experts also find rare local silver, a valuable doll and a collection of drawings by Beatrix Potter worth a small fortune.